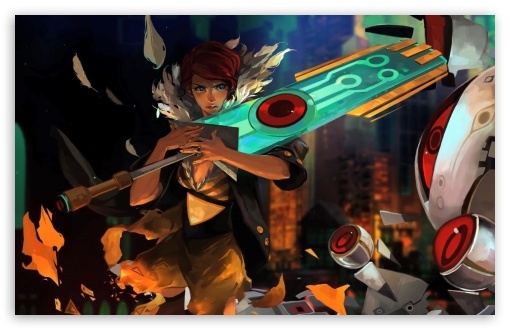 When I had that Supergiant Games was making a new game in Transistor, I was immediately interested. Bastion is one of my all-time favorites. It’s one of the few games I went back and got 100% on, even though that status got rolled back because I did it while my Xbox gamertag was stolen :(. Transistor has a lot of the pieces that made Bastion so great, plus an even better combat system and a story that keeps you begging for more. That story can be just a little too convoluted at times, but Transistor is definitely a game not to be missed. “We’re not gonna get away with this.” Who are ‘we’? Get away with what? You’ll have to play to find out. Cloudbank is a sci-fi city home to our protagonist, Red. Red is a popular jazz singer who, for some reason, has had her voice stolen by a mysterious group. A large, glowing greatsword buried inside an unknown man’s body starts speaking to Red, telling her that they need to get moving. Who was that man? Why is the sword talking? Who stole your voice and why? The story of Transistor is told in such a unique way. The sword, i.e. the Transistor, tells Red that they “aren’t going to get away with this.” Exactly what “this” is, along with who the man and villainous group are is doled out to you in incredibly small segments. There are no NPCs to learn from or cutscenes to get exposition from. You’ll only learn who Red is, what happened to her, and why through playing and exploring the world. The story is told at such a slow, drip-fed pace that it’s hard not to keep playing into the early morning, like when I powered through five hours until 3:00am. If there are no NPCs and the main character has no voice, who exactly tells us this story? The Transistor serves as the game’s narrator, much like Rucks, the narrator in Supergiant’s previous smash hit, Bastion. Also like Bastion, this narrator has a more realistic sound and feel than most video game voices. The emotion, the tone of his voice, and the things he says makes it feel real. He says things that your inner voice is saying as you play the game yourself, like “terminal over there” or “what the hell is that?” At one point, he tells you to go through a door only to say “back back back back” as he sees an ambush on the other side. Pro tip (thanks, Kotaku): if you’re playing on PS4, you can change the Transistor’s voice to come through the controller speaker rather than the TV speakers. DO THIS IMMEDIATELY. It makes the gameplay exponentially more gripping. While the Transistor gives you the story, the details come from functions, which double as combat abilities. Red is battling the Process, an evil group of robotic enemies bent on destroying anything in their path. Each function details a specific citizen of Cloudbank and embodies them, like the football player’s function that hits like a truck. Functions can be equipped in three ways: as an active skill, as an upgrade to an active function, or as a passive. The Transistor uses these functions in combat, which blends action and strategy in a wonderful way. Red can fight in an action sense similar to Bastion, running and gunning to her heart’s content. The real combat kicker is Turn. When you activate Turn, time stops around you. You can move Red around and plan attacks as you see fit, draining a gauge as you do so. When released, Red will run all of the functions chosen in a row, allowing you to exploit weaknesses and deal heavy damage. You need to be careful, though, because the more of the Turn gauge you use, the longer the Transistor will have to recharge before acting again. Balancing what functions to use and where to position yourself with how long it will take to recharge is something that never gets old. As you progress, Red’s user level will increase, unlocking more functions and allowing her to use more functions simultaneously. While there are only 16 different functions, they can be combined in seemingly infinite ways between the four active slots with two upgrades each and four passive slots. For example, you start with a basic short-range beam attack that can be augmented to shoot farther, split into multiple beams, steal life, and more. Save points let you respec, which I ended up doing almost every time I found one. This screen. Learn it, live it, love it. While death isn’t that prevalent in Transistor, it’s handled in an interesting way. If Red’s life reaches zero, she’ll initiate a last-ditch Turn, letting you plan out what will hopefully be your saving grace. If not, however, it isn’t game over. Instead, you’ll lose access to one of your active functions for a while. This can be a huge tide turner, as your main damage dealer might be disabled for three or four combat sequences. Finding a save point will allow you to switch out the disabled function with others. If the combat is too easy for you, limiters can spice it up. Limiters are similar to functions but instead of embodying a fallen character, they map to different enemy types and modify enemy powers like double damage, respawning in less time, or dropping damage orbs on death. Each limiter also adds to your experience gained, but it’s not so much a swing to make them required. I played with a few on for a while, but quickly turned them all off so I could experience the game itself. 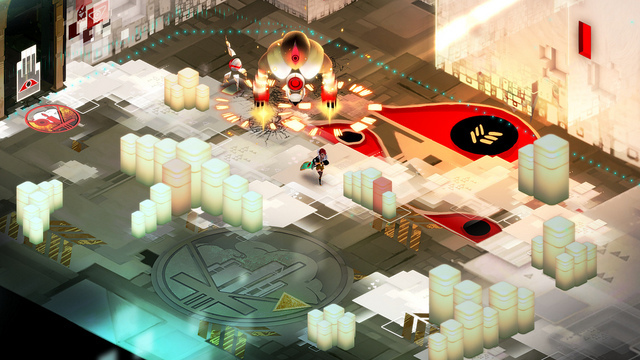 Another fun way to challenge yourself is with Transistor’s version of challenge maps. There are different challenges that test your attack proficiency, Turn effectiveness, and survivability. Challenge maps are unlocked in regular intervals and take place in an … interesting room. I don’t want to ruin it, so I’ll just say that it’s a bit different than the rest of Cloudbank. 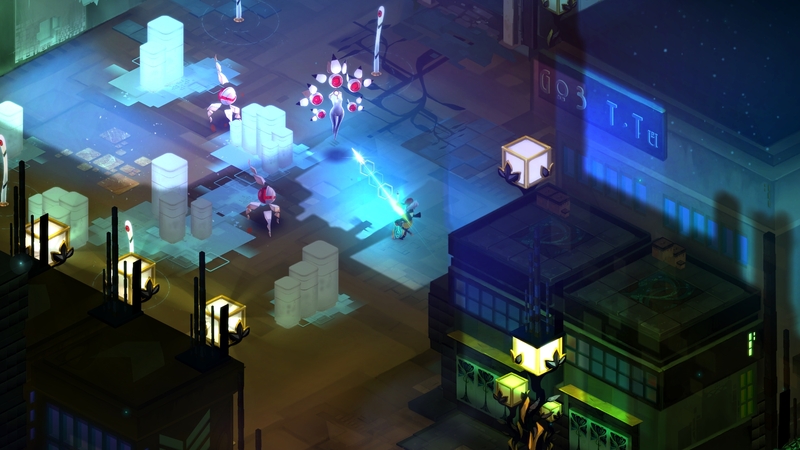 Transistor, much like Bastion, is a work of art to look at. Everything is hand-drawn and just stunning. Characters and buildings are sharp, crisp, and lively in large part due to amazing lighting. Enemies and environment pieces explode into shards when destroyed, showing off the lighting even more. Colors are all over the board from bright neons to creeping darkness. My only complaint with Transistor is that while the way the story is told is certainly unique and addictive, untangling that story can be a overly complex at times. When the game was over, I thought I knew how everything fell into place, but I had to look it up to be sure. That may have been in part to my five-hour power session to finish, but the complexity could have been toned down just a bit. I also want to take a second to point out all the tech/programmer terms used in Transistor. Functions, users, administrators, processes, superuser — as a professional programmer, those were fun to see. I’m not usually one to go back and replay games, but I enjoyed Transistor so much that I immediately dove into Recurse mode (new game plus) as soon as I could. The blend of action and strategy and the nearly endless combination of abilities makes Transistor awfully hard to put down, not to mention the just plain beautiful visuals and story that keeps you begging for more detail. If you have access to it, pick up Transistor ASAP.